I have always thought that Johann Sebastian Bach’s music inspired by Christmas has been overshadowed by his music for the Easter season, so perhaps this set might put this right. Here we not only get the wonderful Weihnachts-Oratorium but also seven discs of cantatas, seventeen cantatas in all, and a single disc of organ music, a Bach Christmas feast indeed. So, all the Bach you need for this and subsequent Christmases, from Advent to the Epiphany, is covered in this set. It comes with a short but informative written introduction by Peter Quantrill, but sadly no texts. A visit to the Brilliant website does not provide their customary link to sung texts either, but they are well known and available elsewhere without much effort. One can also look on-line for the Brillian editions from which these recordings are taken, but those texts tend to lack translations. The set opens with a classic account of the Weihnachts-Oratorium from 1974/1975, big-boned and traditional in outlook. It is a little heavy for my liking, but this recording has a lot to offer, not least the excellent singing of the soloists. From Jauchzet, frohlocket, the opening chorus, it is clear the singing is something special. The Dresdner Kreuzchor is on fine form, but it is the soloists that deserve special mention. Annelies Burmeister is excellent, as is Peter Schreier as the Evangelist and Theo Adam as Herod, whilst the late great Arleen Auger is great as the Angel. The Dresdner Philharmoniker are also excellent. Indeed, this recording under Martin Flämig is regarded as one of the finest recordings from the former East Germany, and one can understand why. It has been released in several formats and on several labels, most recently on Berlin Classics. This is a classic recording of its kind, and it deserves its place in this collection. It has hardly been out of the catalogues, and it is easy to understand why. Included in this set are no fewer than seventeen cantatas for the Christmas season. They do not represent all of Bach’s extant cantatas for the period between Advent and the Epiphany, but it is a very good selection of his Christmas cantatas. They have all been taken from there 50-CD set of the complete sacred cantatas performed by the Netherlands Bach Collegium under Pieter Jan Leusink (94375). On the whole, these are fairly good recordings, with good orchestral and choral sound,. The soloists are good; there are occasions when the soprano Ruth Holton sounds a little stretched, but not enough to spoil the recording. For example in the arias Ich wünschte mir den Tod of Cantata BWV 57 and Offne dich, mein ganzes Herze of Cantata BWV 61 she sounds at the limit of her range. There are other occasions when she sounds more at home in this music. For example, in the Cantata for the first Sunday of Advent BWV 36 she is in fine voice throughout her long solo aria, whilst her duet with Sytse Buwalda in the Choral Nun komm, der Heiden Heiland is excellent. The rest of the soloists are in fine form throughout. I particularly like the bass of Bas Ramselaar. His aria Streite siege, starker Held from BWV 62 is filled with colour and characterful singing. The choral singing is very good. Take the opening of BWV 62, which also benefits from some very fine oboe playing. The opening chorus is very good indeed, especially in the way that they weave in and out of the instrumental soloists. They have some important passages to sing throughout the cantatas. I am glad to say that their singing is expressive and a highlight of this set. The instrumentalists are very good. I have already mentioned the fine oboist. One who needs a special mention is the sadly unnamed organist, fine throughout, whether as a continuo player or as a solo support to the solo vocalists, the playing is wonderful and a real boon to this set. The brass section is in fine form also. Just listen to the opening of Christen, ätzet diesen Tag BWV 63, where there playing is precise and wonderfully balanced so that they do not overshadow the chorus. The performance might not be as good as some others, perhaps Gardiner or Suzuki shine forth, but in the context of this set the Dutch performance works well. The disc of organ music is taken from Stefano Molardi’s recently recorded 15-CD complete edition of the organ music (95105). The disc opens with the wonderful Prelude and Fugue in C Major BWV 545. It includes tinkling bells in the Prelude and is followed by a very good performance of the Fugue, although the Trost organ of the Stadtkirche in Waltershausen does have a noisy action, something which is picked up by the recording. It seems to be the only recording of this organ on this disc. There are some very nice recordings here, mainly without noisy actions. The short pieces from the Orgelbüchlein are very well played. Listen to Gott, durch deine Güte BWV 600, Herr Christ, der ein’ge Gottes Sohn BWV 601, or the famous In dulci jubilo BWV 608. Molardi’s musicianship and skill as an organist shine through. The Canonic variations on the Christmas hymn Vom Himmel hoch, da komm ich her BWV 769a are truly wonderful. The disc ends with another wonderful recording of a Prelude and Fugue, this time the one in C BWV 547, with the Fugue proving a fitting climax to the disc. I know very little of Stefano Molardi’s playing, but this disc made me return to the two discs of Bach’s famous organ works included in the Brilliant release of the 500 Years of Organ Music (95310). On the evidence of this disc along with those, this is a set that will be going on my wish list. The playing is excellent throughout, on this and the other two discs, with the organs captured well with a sonorous bass sound. This is already the most played disc in this set. For many readers, this set will duplicates a lot of the recordings. 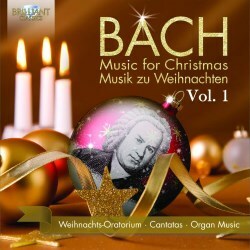 As an antidote to the endless discs of Christmas Carols – and for those who have a limited collection of Bach’s music – this set works well and is in fact a real winner. I like a leaner, more historically informed performance of the vocal works, but these performances, especially of the Weihnachts-Oratorium, are good enough to deserve a spot on my shelf. It is a shame that there are no texts and translations, but if one looks up the original releases on the Brilliant website, the texts are there. Translations have to be found somewhere else, but this is not difficult. Some might quibble at the short measure of some of the discs of cantatas, but at budget price one will soon gets over this. All in all, this is a very intriguing and welcome set, one which will be played all year round and not just at Christmas.